Wine tasting, wineries, vineyards, and tasting rooms are the staple attractions of Monterey County. The competition grows every year, with more wineries and wine shops opening their doors to oenophiles from all over the world. 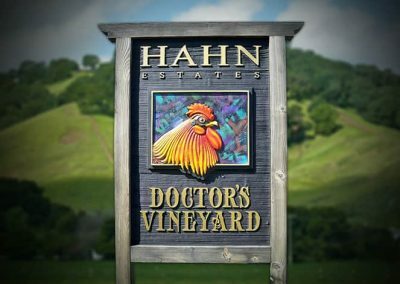 This is the best opportunity to use your signage to make a name for yourself while you accentuate the personality of your winery or tasting room. True wine fanatics love to identify themselves with specific brands, colors, and flavors. They feel that they favorite wines are the best and they value their tasting experience quite highly. The interior and exterior of your locale must represent your brand and the clientele that you want to attract. Signage is essential to your brand, and it will make a difference. Your custom vineyard sign should embody the intricacies of wine, such as romance, enigma, and elegance. Your sign also represents what your business has to offer: fun, excitement, and pleasure. Use your business sign to deliver your message: your logo, your motto, your symbols, your colors, and your letters. We want your sign to be known from a distance and to be remembered by all tourists and visitors as the “one” sign that was able to stand out, and represent your brand as it is. Trust the experts at Signs by Van to make your sign into a piece of art that tourists and clients will never forget. Our skilled craftsmen create vineyard signs in-house using a combination of traditional methods and state-of-the-art technology. We have a number of techniques for your to choose from to create the sign that best emobodies the spirit of yor vineyard. A vineyard sign from Signs by Van can be your marketing partner that fuels your brand and works for you 24/7.